We had an absolutely wonderful final prep day. We took time for journaling, deepened our discussions of what it means to be a traveller rather than a tourist, did some role playing (for example: what should you do if your roommate is too messy? What if YOU are the too messy roommate?) and created a document with community agreements, which we all signed. I must say that we have been extremely impressed with this group and the ways they are coming together to support each other as they prepare for a long period in their stretch zones. We also finished an activity examining some famous quotations about traveling. Students did a “gallery walk” with quotes hung about the room and were asked to complete a series of tasks related to what they were reading. One task was simply to vote for a favorite quotation. The two winners were, “It doesn’t matter where you are going. It matters who you have beside you,” and “Traveling should leave you speechless, then turn you into a storyteller.” These choices tell us a lot about this group: they care about community, they look forward to adventure, and they want to come home and tell you all about it. As you prepare for tomorrow’s send off, give yourself a pat on the back. You are putting wind into your child’s sails, helping them venture off into the world. They are embarking on both a physical and social emotional journey, and they will come back more worldly, more confident, and more grown up. If you’re like me in moments like these, you feel both proud and sad - proud of your child’s courage, and sad because they are stepping slowly into adulthood (and therefore away from us). We are so excited for this journey with them! See you at the airport tomorrow. 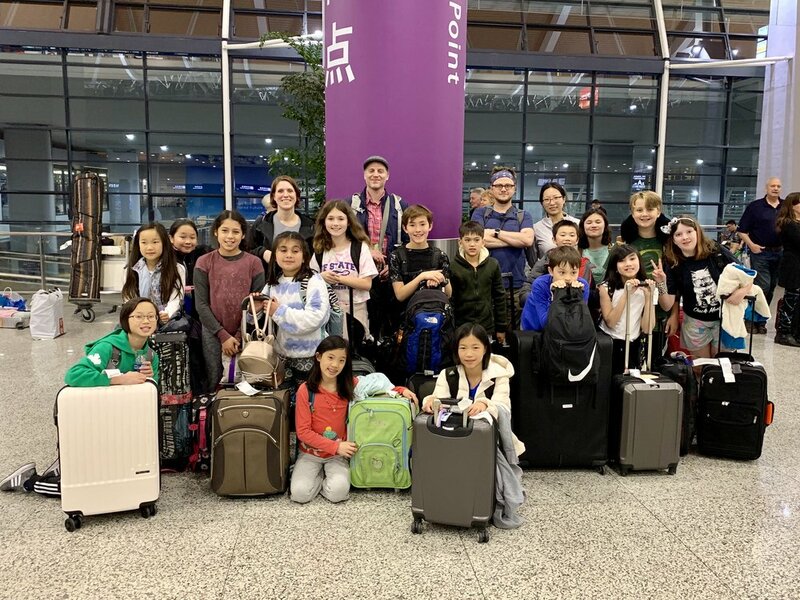 After a smooth flight, our group touched down in Shanghai and met Ma Laoshi at arrivals. She distributed bananas, oranges, water bottles, and hugs and got us right onto our bus to Huizhou (the ancient town at the foot of the Yellow Mountains where we will spend the next week). The morning walkers thus got a big dose of Huizhou hospitality! Here they are celebrating the early morning with fresh 豆浆and 油条. Once everyone was awake, we started our orientation. We walked the town and got to know our neighbors. Another great sentence came from a student at lunch. Upon seeing the fish we were served, she declared, “I want the eye! I call the eye!” At lunch, as with the rest of our trip thus far, our students have been filling us with pride with their sense of adventure, their teamwork, and their mindfulness. 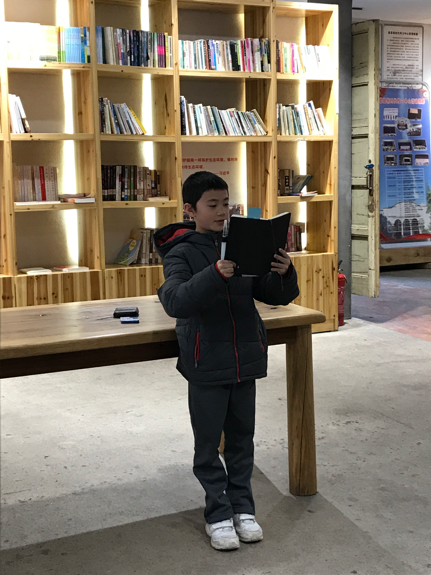 Our orientation continued with Matthew teaching about local wildlife, a guide teaching about Huizhou architecture, and a walk along the town’s river. One activity the students enjoyed was a “five senses comparison” of San Francisco and Huizhou. We gave the students a minute to simply stand and listen. Does this place sound like home? We gave them a minute to breath deeply. Does it smell like home? We checked in on each of our five senses as a way to awaken our ability to soak in this new place. 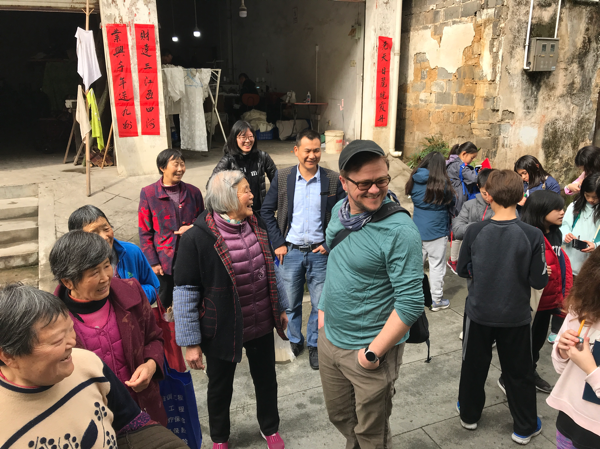 After lunch, we took a nice long 休息, then began a scavenger hunt in the old part of the village, built about 1,000 years ago during the Song Dynasty. Students split into four groups to solve challenges like “Find the九龙壁 and determine when it was built” and the favorite “Buy a snack you’ve never had before. What is it, and how much did it cost?” Students jumped right in, asking for directions, asking questions about local monuments and history, and posing for photos with curious town residents. This evening’s closing circle began a routine that we will continue for the rest of our time in China, and on each following trip. Students and teachers shared their ‘roses and thorns’ from the day. Teachers’ roses were all very similar – we noticed how proud we feel of our students. We have all seen them stretch themselves, look after each other, and engage respectfully with the local community. We are off to a good start! One of our teachers happily overheard a student say this as we boarded the bus after a full day of picking, roasting, and studying the history and culture of tea in the Yellow Mountains. The day began as usual with a healthy meal and a healthy discussion. The meal was fried eggs, baozi, porridge, and fruit. The discussion was about the lives of tea farmers in this area and the economics of global food production. How much does a tea picker earn from selling a pound of raw tea? How much does an ounce of tea cost at Whole Foods? What is “fair trade”? Why, if at all, does any of this matter? For many city kids, the question of who grows their food and what their lives are like is an impossibly distant and confusing abstraction. One day of tea picking, however, gives us ample opportunities to understand more about food (in particular) and global trade (in general). Beyond these discussions of food, our students had an incredibly active day of hiking, tea picking, and tea roasting. They went high into the hills to pick Mao Feng Tea, famous around the world but only grown in this small region. Each student took a basket and headed into the tea plantations to pick a very specific kind of young leaf from the trees. A leaf that if too old is bitter; a leaf that if too young is flavorless. The students learned from a farmer how to identify the perfect leaves. After a few hours of picking, we went to the farmer’s house to roast the tea. Students learned that the tea must have most of the moisture removed or it will quickly rot. They participated in the two-step hand-roasting process. Finally, they bagged the tea (and will bring it home to you). We suggested that they do a taste-test with you after they return by buying some Maofeng tea in San Francisco and comparing its flavor to what they picked themselves. More pictures of our tea picking adventure below. Our group of early morning adventurers has now grown to 11 - despite the chilly morning mist today, many students were keen to fill up on the freshly cooked breakfast treats available in the alleyways near our hostel. After breakfast, some students called home, some played cards (斗地主 or “Kill the Landlord”), and others played 五子棋 (wǔzǐqí). Everyone seems to be fully recovered from jet lag and getting into the routine of our days. Yesterday we learned the process of making green tea, a relatively simple process of drying the leaves after picking them. Today, we went to a black tea factory and learned the much more complex process of fermentation necessary to give black tea its particular flavor. As we walked into the factory, there was a collective deep intake of breath, and many people said ‘好香！’ The scent of fresh tea leaves being gently dried over hot coals was unmistakable. At the factory, we saw how black tea is processed after it is picked. We visited each piece of equipment as the owner explained the process of taking the freshly picked leaves, drying them, grinding them so that the fermentation can start, putting the tea in a kind of ‘tea sauna’ to ferment, laying them on heated coils to raise the temperature just high enough to stop the fermentation, and then finally placing them in large heated baskets until the leaves were crispy and blackened. 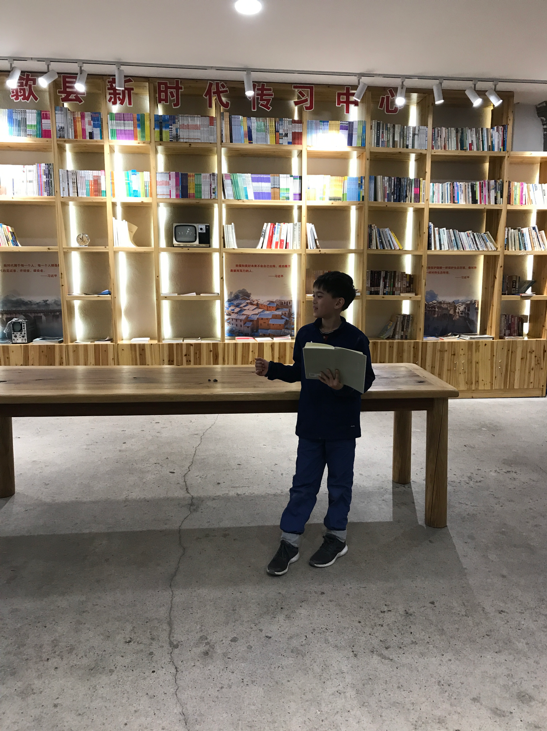 The tea master’s lesson was rich in complex scientific vocabulary, and it gave Ma Laoshi an opportunity to remind students of vocabulary and processes she and Liu Laoshi have taught in this year’s science lessons. As we dug our hands into piles of freshly toasted tea leaves, students realized why this kind of tea is called ‘red’ in China (红茶), but ‘black’ in the US. One country names its tea after the color of the prepared leaves, one after the color of the drink once water is added. After learning how tea is prepared, we had a tasting session. Words used to describe tea's taste and smell included “sweet,” “umami,” “fruity,” “honey,” “hair,” “fresh cut grass,” and “floral.” We may have some students with wine connoisseurs as parents. Just a guess. Another taste sensation for many students was lunch time’s 臭豆腐, literally stinky tofu. Many students tried this fermented tofu dish, with most of them deeming it either ‘good’, or ‘not as bad as I expected’. 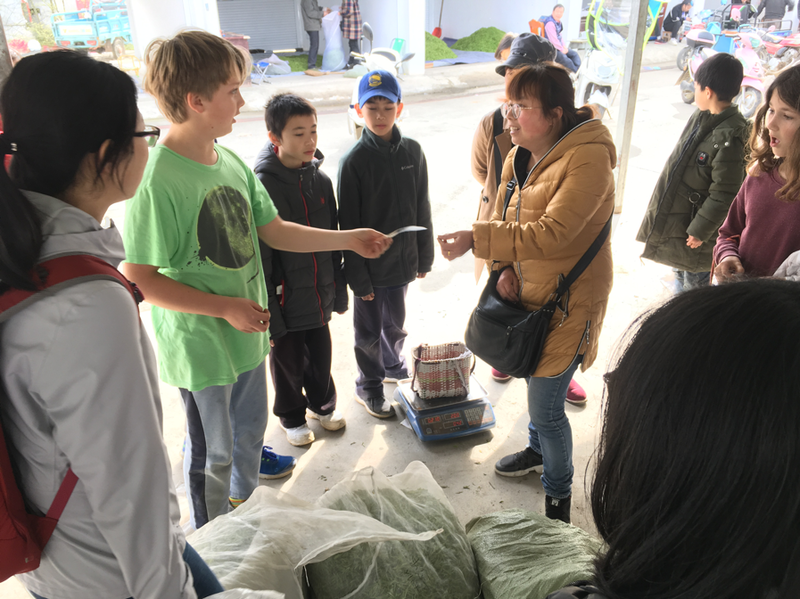 This afternoon’s activity was the culmination of our studies of tea - picking and selling tea leaves for 红茶 (red tea) at the wholesale tea market. We spent a happy hour by the river, picking tea leaves in the sunshine and listening to the music Ke Laoshi and a local farmer were making on handmade bamboo instruments they created as we worked. We learned that there are slightly different requirements for picking tea leaves intended for red tea - they should be slightly larger than the leaves for green tea, to allow for better fermentation. 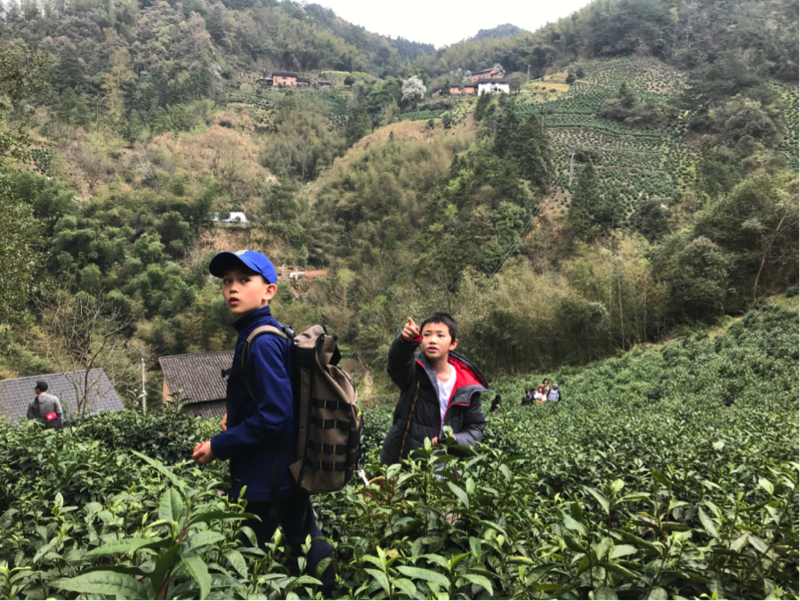 The students worked hard picking their tea (and swapping strategies for getting the most leaves into the basket in the shortest possible time). The hour passed quickly - many students (and some teachers) did not want to leave! Ma Laoshi considered a career as a tea-picker (‘so addictive, I just want to get them all!’) but we convinced her to stay with us, and take our tea to the market. They negotiated prices, took tea to the weighing scales, and eventually sold the results of their morning’s work for a fair price. After selling their tea, one group went around to other tea sellers, offering to help them with their work. Although 9 sellers said no, the group were undeterred, and their persistence paid off when the 10th seller said yes and gave them a job sorting through the leaves and removing any oversized or overly tough leaves. Reflecting on this activity later showed the depth of students’ learning today. Many students chose picking the tea as their ‘rose’ for the day. The process of selling the tea brought up some strong emotions for many students. Some students said that selling the tea was their ‘thorn’ of the day - an experience that contained challenges that they had not expected. Interestingly, students’ perceptions of the challenges of this activity highlight the positive qualities that our students are developing. While students mentioned that a key challenge was feeling overwhelmed as a newcomer in a professional situation, their main challenge was frustration at wanting to be involved, but finding it difficult to engage as fully as they would like. Our students do not want to sit on the sidelines. They want to engage deeply with real life activities, to be taken seriously, and to understand the processes that they are a part of. After selling their tea for a fair price with the help of a local tea-seller’s daughter, students expressed appreciation for the help but also frustration at being helped too much. Another group, after being given market rate for their tea, didn’t just take their profit and celebrate. They continued to try to understand the process of price-setting for tea, and discuss how it feels when you don’t understand how deals are made. They puzzled about why they had received 20 kuai when they thought they had negotiated 60. They later worked out that 60 kuai was the price per jin, and since they picked 1/3 jin, they received 20 kuai for their efforts. We discussed how it feels when you are expecting one thing, but something else happens. How can we thrive in a new situation where we feel out of our depth and unfamiliar with procedures? How can we maintain flexibility, an open mind, and a sense of humor while learning something new and challenging? And on the flip side, how can we recognize when people coming into our lives are entering unfamiliar territory, and how can we help them feel supported and welcomed? Through tea, we’ve learned and discussed skills and mindsets that students will take with them on future travels. 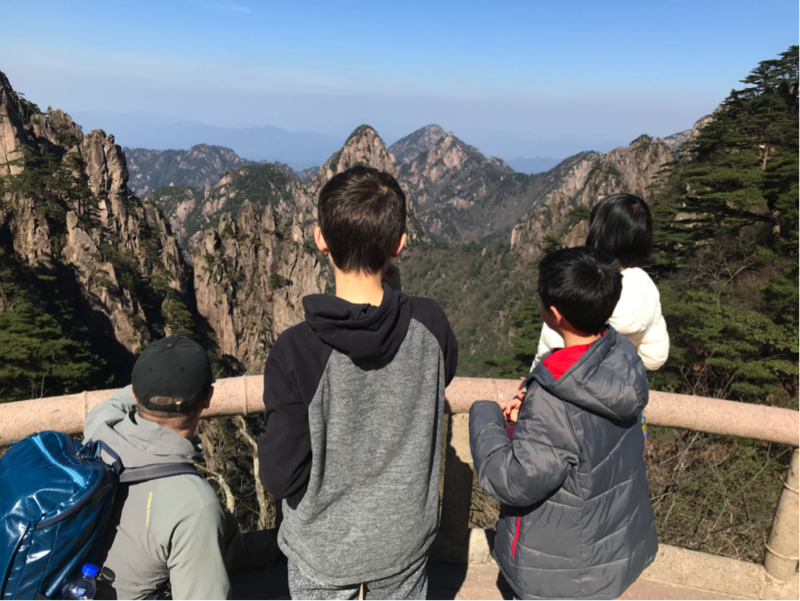 Spirits were high on our bus ride to the base of the Yellow Mountains, so named because the first Chinese Emperor, Huangdi, visited there nearly five thousand years ago. Our tour guide, Ren Laoshi, was kind and patient. This was very good because we made many stops along the way, and can you blame us? There were fascinating insects to look at, natural springs that sang to us, and amazing rock formations with legendary appearances- one looked like a sitting monkey, another like a turtle, and a third like the Bodhisattva of compassion, Guanyin. For Tibetans, the Dalia Lama is the 14th reincarnation of this original disciple of the Buddha, a topic of fascination for the group when Mike taught a bit of Buddhist history. “How do they know which baby he reincarnates into?” “Why is Guanyin a woman in most of the pictures in China, but the Dalai Lama is a man?” “Why does she have 10,000 arms in some pictures?” Quiz the 5th graders when they get home- see if they remember the answers. Getting to the top of the mountain was a challenge and the group really needed to come together as a supportive team to make it happen. One student was feeling nauseous. Another had a fear of heights. A third was exhausted by the long hike. The group pulled together and helped. One group sang “George of the Jungle” to make the gondola ride just a little more bearable for the friend afraid of heights. We saw hugs and heard quiet words of care and encouragement for the friend with the upset stomach. We all made it to top of the mountain and settled in for a poetry class from Ms. Charlotte- she asked students to write from the perspective of the mountain, or from the perspective of one of the workers who must carry food and building materials form the base of the mountain to the top for travelers like us. 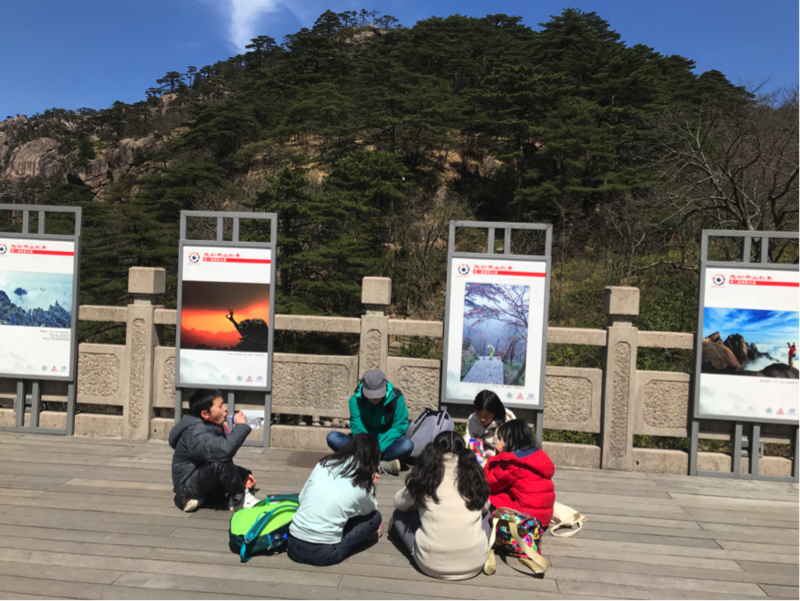 Poetry on the top of Huangshan. Ma Laoshi and a student on the gondola ride down from the top of the mountain. And so it was a long and wonderful day full of sunshine and fresh air and delicious food. Students are now asleep in their rooms with tired legs and full minds. Tomorrow we go to market to purchase ingredients for food to cook with a chef. There’ll be calligraphy as well, a history lesson, and a nice long wander down the river. Today was a day of recovery after yesterday’s Yellow Mountain hiking. We slept in a bit and held our morning circle over cups of hot tea and baozi. We shared roses and thorns and then did a mid-trip check-in. We can’t believe we are halfway finished with this journey! Students at the local market, shopping for the ingredients for the dish they would later cook for lunch. We looked back to the agreements we made before we left San Francisco: to be adventurous, to be kind, to be grateful, to be supportive of each other, to be mindful, to be engaged, to be curious. The group agreed that while we have had moments of falling short of our goals (the occasional groan at wake up, or moments where some students wished for a fancy hotel instead of the simplicity of our hostel), on the whole we were all very proud of our ability to embrace the traveler’s mindset. After morning circle, we started our activities. We rotated through three classes. The first was a cooking class, the second a calligraphy class, and the third a history class. Students broke into small groups for these hour-long sessions. A student tries to get a discount on some lima beans. Calligraphy class with Wu Laoshi, a local artist. Ms. Charlotte’s second “writers’ workshop”. After our morning classes, we ate lunch and had a long 休息. Students rested, did some journaling, played cards, and a few took cat-naps. It was a rainy day and the sound of the rain on the tile roof of our hostel helped us all stay mellow. One group of students sat on the balcony for half an hour with mugs of hot water in their hands and just watched the rain fall on the distant mountains. Before long it was time for our afternoon class rotation: UoE work with Ma Laoshi (students went into the city to observe the ways the disabled and elderly are -- or are not -- supported by laws, regulations, and customs); a writing class with Charlotte; or the group favorite... laundry with Matthew! Each student hand washed a few key items so they would have enough clean clothing for the rest of the trip. Forgive us in advance if they return to you a bit... ripe. One of our big themes for the day was embracing simplicity. We wanted our students to see simplicity not as a lack of something, but instead as a gift. A simple meal. A simple room in a hostel. A day spent with simple technologies: a journal and a pen. Ma Laoshi prepares her group to go into the city for some “field work”. In our closing circle conversation, our students showed awareness of their privileges. They named the following: they all have loving parents who work hard to provide for them; they can go to a school like PKS; they are generally healthy and able-bodied. We are proud of them for recognizing all of this, and we encouraged them to be thankful for it (and to tell their parents how grateful they are!). Simplicity is hard to find in our rushed lives in San Francisco. But for these two weeks, our students are finding comfort in this rare gift. Today was our last day in the Yellow Mountains! Tomorrow, we head on to Hangzhou for our final 3 days. Time has flown by. We have experienced so much together over the last week, both in what we’ve learned about this place and how we grew as a team. What is one goal you want to set for next year’s trip to Dali? What part of you has changed during this trip? Go back to the quote you wrote at the front of your journal. How has this trip helped you think more deeply about this quote? Describe, in rich detail, a moment when you were in a stretch zone. Make a list of all of the people who helped you on this trip, and how they helped. How has your understanding of China changed (culture, history, politics)? What questions do you still have? If you could go back in time to the day before the trip, what advice would you give yourself? When students have an authentic purpose, they can be extremely focused writers. The morning was spent carefully writing down answers to these questions, memories that students want to carry with them for years to come. Students wrote for nearly three hours. The atmosphere in the room was like a writers’ retreat – there was a comfortable silence as everyone concentrated on their writing. Today’s activity reinforced the idea that there are no ‘reluctant writers’. Everyone wants their voice to be heard, and given a real opportunity to do so, they will make the most of that opportunity. Even though our trip is not over, we held our closing ceremony this afternoon. The closing ceremony is an important tradition for PKS东南西北. In the Yellow Mountains, we hold the ceremony in a beautiful theater built in the 1950s. Students sit in on a long wooden bench, and come forward one-by-one to stand in front of the group. They each take a small stone in their hands, read from their morning’s reflections, then place their stone on the table forming a circle of stones. After our ceremony, we had a phenomenal feast for our final Yellow Mountains dinner. Below are some short excerpts from their reflections, some of which were written in Chinese, some in English, some in prose, some in poetry. “If I could go back in time to the day before the trip, the advice I would give myself would be: ‘Don’t worry Scout, it will be a fun trip. You will miss your parents, but you can call them and tell them what you’ve been doing. Just try and have fun." For our blog today, we put together a series of images of the trip thus far . . .
We started today in beautiful Longjing Villiage 龙井村, where Long Jing Cha (Dragon Well tea) is grown. We walked a long mountain path winding through stunning scenery (a path the Qianlong Emperor is said to have walked) to visit the National Tea Museum (中国茶叶博物馆). Did you know that while China is the largest tea producer in the world, Kenya is the largest exporter? And that Turkey is the largest consumer of tea per capita in the world? Or that Pakistan is the top importer of tea? The afternoon was spent at the fantastic Hands-On Handcrafts Museum 手工艺活态馆, where students worked with a local craftsman to make their own 油纸伞. Making the umbrellas required hours of precise, detailed work. Walking around the workshop, we heard sounds like: Ah! Gah! Grrr! Shoot! Urrrgg! Students carefully attached the rods, threaded their needles, reattached the rods that had come unstuck, rethreaded needles that had come undone, and joined the mechanism together with an intricate pattern of thread. Students learning from the umbrella craftsman (the art from has been in his family for 9 generations). Finally, after two hours of hard work, we began to hear: “Aha! I did it! I finished!” and finally, “That was so much fun!” and “Can I make another one?” Students are bringing the umbrellas home to you – make sure to admire their handiwork. Mike watches a student enjoy her noodles. His obsession with Lanzhou Lamian is legendary. After a quick break for ice cream, we headed to a much-hyped event – a Lanzhou Lamian 兰州拉面 dinner. Mike had been talking up this famous noodle dish for the entire trip, declaring it “the best food in China." “You will love it!” he promised. We weren’t sure if this was a prediction or a command. We found a small family restaurant where we occupied every seat in the house, and watched the noodles being made from scratch. Lanzhou Lamian is a dish that comes from the northwest of China and is almost always made by members of the Uighur Muslim minority group (the history, geography, and politics of this group made for fascinating conversation on the bus ride home). Each bowl of Lanzhou Lamian consists of one very long noodle, coiled around hundreds of times in a large bowl of savory broth. The noodle is made from one block of dough, which is stretched, twisted, pulled, and slapped into this single long noodle. The dish did not disappoint. The room was silent except for slurping as students and teachers alike celebrated Mike’s recommendation. Tomorrow is our last full day in China. We will see you all soon! Our last day in China began like all the others: a leisurely breakfast of eggs, rice porridge, pickled vegetables, milk, and baozi. As we ate, we talked about our favorite memories from the trip. 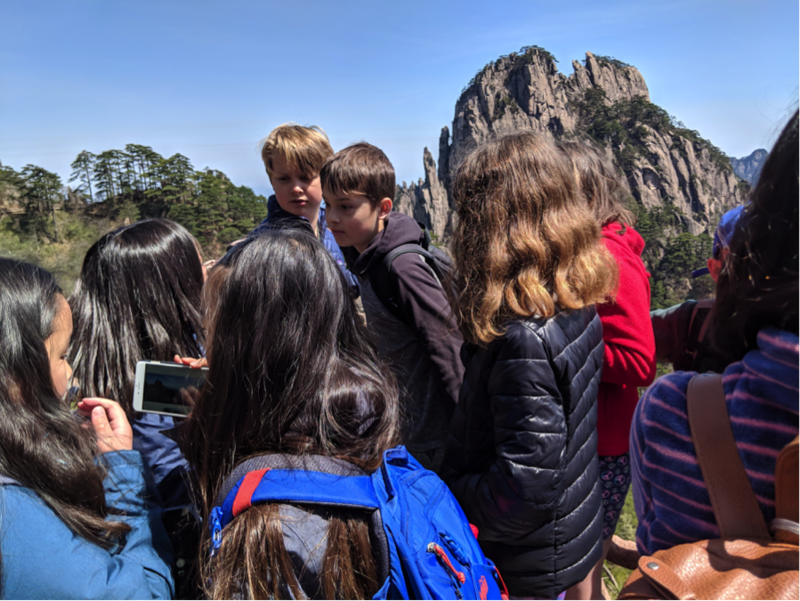 The views from the top of Huangshan; selling tea in the wholesale market; singing “Fish Heads” during bus rides (definitely ask a 5th grader to sing it when you see them on campus); discussions of Buddhism and economics; early morning walks in the village for 油条 and 豆浆; closing circles; playing斗地主; journaling; seeing each other succeed and try new things. “How many days until the 6th grade trip?” asked one student. “I worried I’d be homesick before the trip. Now I don’t want it to end,” said another. After breakfast, we journeyed to one of the schools in Jack Ma’s Alibaba school network. This was a bit of a last minute opportunity, but it was one worth taking. As our bus pulled into the beautiful school grounds, a giant scoreboard greeted us with the words “Welcome Presidio Knolls School!” Our students were nervous and excited to be ambassadors for PKS and for American culture. Before departing the bus, we gave them some pointers on how to be good guests and how to show their gratitude and thanks. After a group photo, each PKS student was paired with a local student for 1:1, VIP tours of the campus. The tour ended in an art classroom filled with photographers and a videographer. The visit was clearly a big deal for our host school. 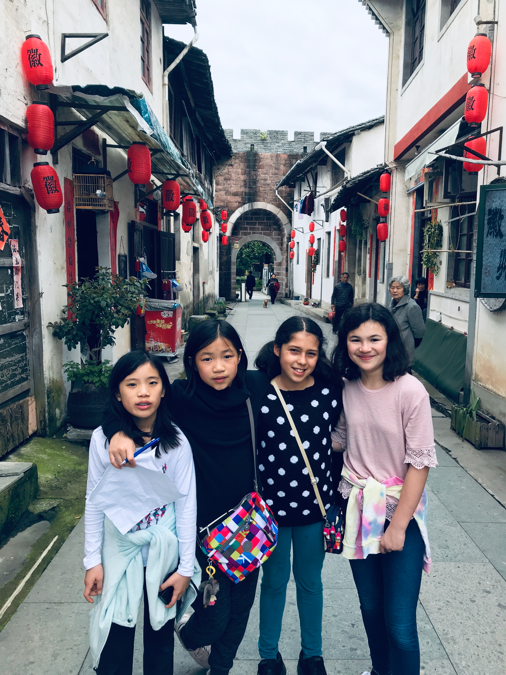 We played games, we shared insights into Chinese and American culture (particularly insights tied to the next UoE for Grade 5 focused on helping the disabled and the elderly), and eventually moved on to play soccer and basketball. After lunch, we said our goodbyes and went to a park at the edge of town filled with winding mountain paths leading seemingly into the clouds. 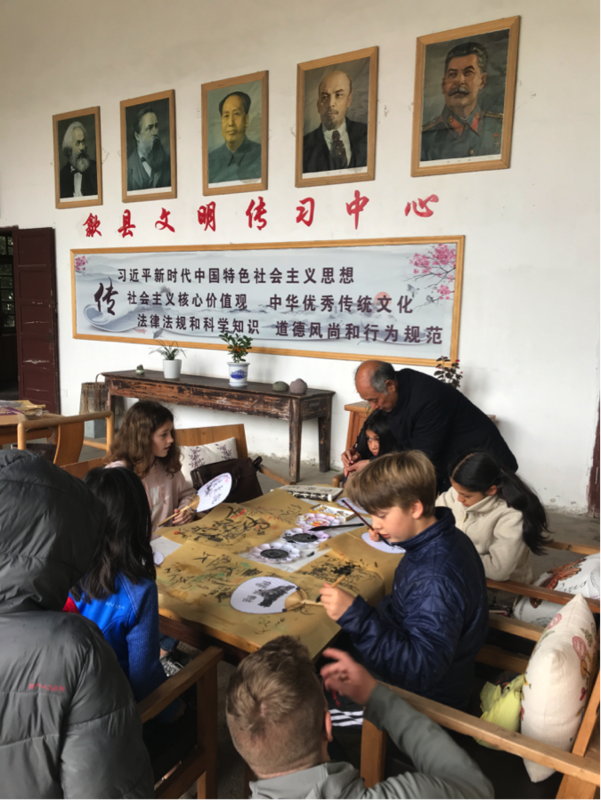 Our guide, Kuang Laoshi, gave the students her hand drawn map of the paths and let them take the lead. They successfully took us on a 3-hour hike that gave us panoramic views of the city below. After the hike, we took a long rest and ate ice cream. Kuang Laoshi then took us to one of Huangshan’s famous snack streets and we wandered as the sun set munching on local treats. We are now back in the hostel. Students are showering and slowly packing their bags. We leave tomorrow at 5am for the airport. It has been a wonderful trip. We are all happy, exhausted, stinky, giddy, and full of new ideas and new confidence. We can’t wait to see you all tomorrow!